In the year 1849, in the village of Schöfflisdorf, in the canton of Zürich, in Switzerland, Hans Georg Mülli was living with his wife, Anna, and three children—Heinrich, Johann Jakob, and Anna. He was a cabinetmaker. In that year he went to Zürich to apply for a passport for himself, his wife, and their three children to travel to America. The passport, which was issued on April 6, was for travel to America via Belgium, Germany, Prussia, and Holland. The Müllis may have traveled down the Rhine to Rotterdam, from where they could sail to London, and on to the United States. During the 19th century many Swiss citizens left their native land to start a new life in America. Most left because of economic factors. There was persistent poverty; many people could not find enough work to feed themselves and their families. So that there would be fewer mouths to feed during periods of economic recession, local councils gave people a financial incentive to emigrate. There was a serious famine in Switzerland at the time the Müllis emigrated. Possibly the village of Schöfflisdorf assisted the Müllis with the expenses of their emigration. The Müllis departed from London on May 1 among 350 passengers from Germany, England, and the United States. Switzerland was not listed as their country of origin. Because the Müllis were German speakers, they were grouped with immigrants from the German states. They arrived at Castle Garden, the main immigration center in New York City prior to Ellis Island, on June 7, 1849. They had sailed from London on the packet ship Hendrik Hudson, undoubtedly in steerage. Packet ships were sailing ships that carried passengers and cargo. The voyage from London took thirty-eight days. The manifest of the ship Hendrik Hudson lists the parents and two little boys, aged 3 and 2. Sadly, the Mülli daughter had died of measles on April 9, just a few days after Hans Georg had applied for the passport and a few days before they must have left for America. Hans Georg’s wife, Anna, was pregnant at the time of sailing, but there is no record on the ship’s manifest of the birth at sea of a child. 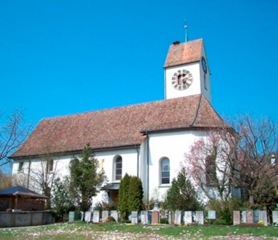 However, Schöfflisdorf church records show the birth of a Mülli son on May 25 on board the Hendrik Hudson. He was named Henry Hudson after the ship. The church records also include his death in Ohio a short two months later. What this family endured before they arrived in Ohio is beyond imagining. The family settled in Wayne County, Ohio. The four largest immigrant groups in Wayne County in 1850 were from Germany, 1,077; Ireland, 555; Switzerland, 513; and France, 480. It was likely that the Müllis knew, or knew of, Swiss people who had settled there. Their son Johannes was born in 1850. At some point they anglicized their names to George Mealy, and sons Henry, Jacob, and John. Anna obviously did not need to change her given name. They had two more sons, Harmon in 1852 and George, Jr., in 1858. The names George and Jacob have been passed down the male line to the present. In September of 1861, the oldest son, Henry—who must have been caught up in the fever of the Civil War—enlisted at the age of sixteen as a musician in the Ohio Volunteer Infantry. He would have been either a drummer or a fifer because boys from twelve to seventeen could serve in that capacity. This is the first record I have of a Mealy as a musician, a tradition that has continued to the present. Henry remained in the military after the Civil War concluded—as a musician in a regiment of the US Infantry that was posted in what is today Wyoming to protect prospective miners from raids by American Indians. On July 4, 1863, Jacob, the second son, also enlisted—as a private in the Ohio Heavy Artillery. Patriotism for his adopted country may have motivated Jacob to enlist, given the date of his enlistment—July 4. He was also very young—only sixteen, although he gave his age as eighteen. He contracted lung fever, as pneumonia was then called, in the fall of 1864. He spent the remainder of the Civil War off and on in the hospital ill with pneumonia—a total of six months out of the two years that he served. In fact, he was in the hospital in Knoxville, Tennessee, when peace was declared. 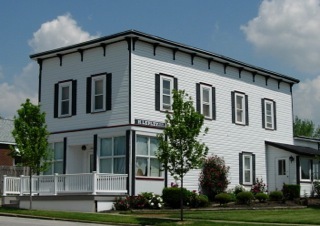 By 1866 the family was established in Doylestown, Wayne County, Ohio. 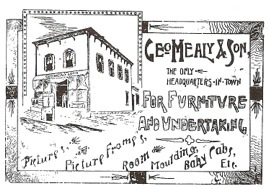 George Mealy had a furniture and undertaking business. 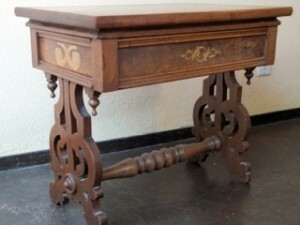 In the nineteenth century furniture makers frequently made coffins and took care of burials. Henry was mustered out of the army in 1867 and married the next year. He moved to Akron, Ohio, and worked there as a foreman in the Hankey Lumber Company until his death in 1899. The third brother, John, went into business with his father. His obituary reveals that he was also a musician: “[Mr. Mealy] possessed musical and dramatic ability of a high order and was largely instrumental in organizing the Doylestown Band in 1874 to which he belonged ever since.” He died of complications from appendicitis at the age of 41, a shock to his family and friends because it was so sudden and just two days after his father’s death at age 80. In 1878 another Mealy child was lost before his time. The youngest son, George Mealy, Jr., fatally shot himself in what was reported in the newspaper as an accident. He was only 19. The fourth brother, Harmon, was also a musician in the military. He enlisted in 1873 (at age 21) and re-enlisted in 1878. The 1880 census shows him at Fort Coeur d’Alene, in the Idaho Territory. He was discharged in that year, and I have no later information about him. He was left a bequest in his father’s will of 1892, but the probate document lists Harmon as address unknown. Jacob re-enlisted in 1870 for a further ten years and served in the American Indian Wars in New Mexico and Texas. When he left the army, he joined his brother working at the Hankey Lumber Company in Akron. In 1881, at the age of thirty-four, he married Emma DeNise, a sixth generation American of Dutch and English ancestry. He and his wife had two children: George Allen, born in 1883, and Earl Granville, born in 1885. In 1889 Jacob applied for an invalid pension on the basis of his Civil War service because he was suffering from poor health and was not able to work full time. He died in 1891 at age 44. His widow was successful in getting a pension to help support her and their two children. Jacob’s eldest son, George Allen Mealy, married Sara James, whose father emigrated from Wales. Harold George Mealy was their only child. He was a professor of music, a violinist, and a conductor. He named his son George Allen after his father. He is the present-day George Mealy, my brother. He is a French horn player who played professionally for many years, but retired as a computer programmer. He named his second son Jacob, who, like his namesake, is not a musician. The music has continued in my line. I am a musician—a pianist and a singer—as is my son, who played trumpet for many years. My brother, George Mealy, the computer programmer, has this end table made by George Mealy, the cabinetmaker.